Once upon a time, there were two immortals who lived in the palace of the Jade Emperor in heaven. Their names were HouYi, an expert archer, and Chang’E, his beautiful wife. One day, the ten sons of the Jade Emperor turned themselves into ten suns. The people of Earth cried to the gods to help them, because the suns were too hot and would scorch the Earth. Chang’E and HouYi took pity on the people of Earth. HouYi took his bow and arrow, and shot down nine of the ten suns, leaving only one to keep the Earth warm for the people there. The people of Earth were very happy, of course, but the Jade Emperor was not. HouYi had killed nine of his ten sons! As punishment, he banished HouYi and Chang’E to live as ordinary people on the Earth. HouYi returned home and placed the magic pill in a special box. He told Chang’E not to touch it until he came back from running some errands. She agreed, but finally curiosity got the better of her. Chang’E opened the box and took the magic pill out of it. She walked outside, examining the pill. Just then, she heard HouYi coming home. Startled, Chang’E didn’t want HouYi to know she had taken the pill from the box, so she decided to hide in her mouth. But, when HouYi came outside holding the now-empty box, she got scared and swallowed it! Right away, Chang’E started to float up into the air. 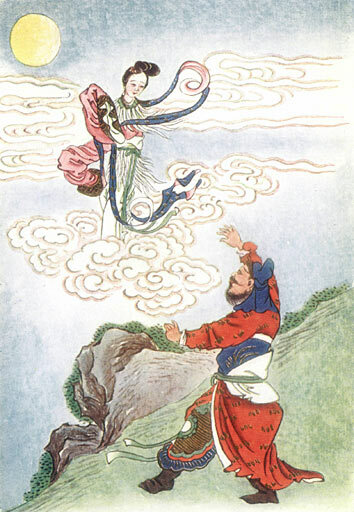 HouYi tried to grab her feet to keep her down, but he couldn’t reach her in time. Up, up, she went, until finally she reached the Moon. Now, she was immortal, and could never die. But her beloved husband was still on Earth. Chang’E was not entirely alone there. The Jade Rabbit also lived on the Moon, where he made the elixir that kept the gods immortal. The two of them became good friends. As for HouYi, the loss of Chang’E changed him from a kind and helpful man, to a cruel and selfish one. He quarreled with one his archery pupils, who in anger hit him with a club, killing him. Because he was a former immortal, HouYi’s spirit rose to the Sun, where he built a fine, golden palace. He and Chang’E both circle the Earth, sometimes passing near each other, but they can never meet.